This is beautiful. Thank you for joining Stampin Sisters in Christ. So simply and yet SOOOO Elegant. 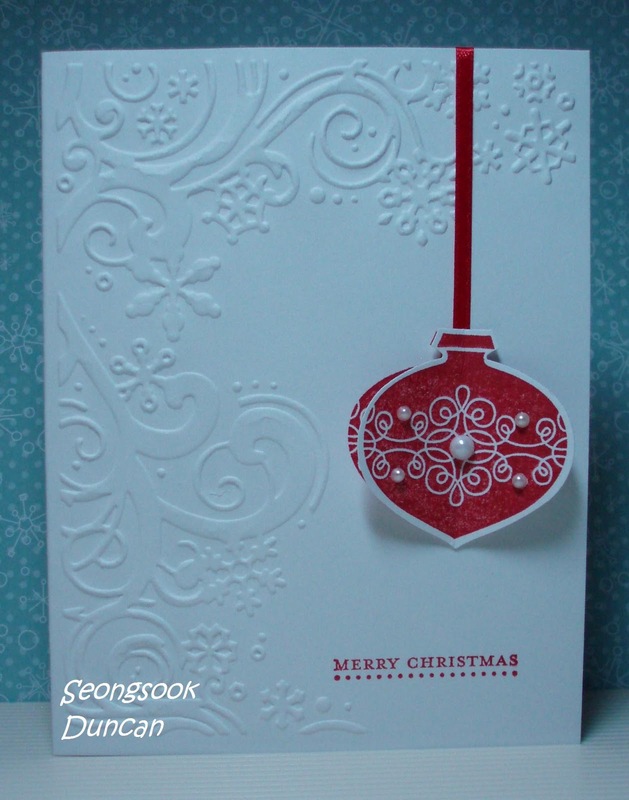 I adore this card love the embossing. Thank you for sharing your card with us at Ellephantastic. This is such an elegant card, I love the embossing! Such a simple, yet so elegant card. I love the embossing. The 3D effect on the bauble really enhances the card. Thank you so much for joining us at Penny's and good luck. Gorgeous, so pretty! Love the layout & embossing & that's a fab bauble! Oh, this card is lovely. Thanks for sharing. Oh goodness this is so beautiful! I love this ef and the ornament is perfectly placed! Sorry I'm a bit late but thank you for playing along with Stampin Sisters in Christ and I hope you'll play again this week! Such a beautiful CAS card! Thank you for sharing with us at Penny's. Good Luck and Merry Christmas! What a super card! Thank you for playing along with Ellephantastic. simply elegant i love it! great job! Thank you for joining us this week on our Anything Goes Challenge at Craft Your Passion. Best of luck! Fantastic card! uJst right for our challenge this week. Thanks for joining us at Winter Wonderland. Thanks for joining us at Penny's Paper Crafty this challenge, hope to see you again next time round. Wonderful card, simple but stunning and very effective! thanks for playing along with us at Ellephantastic. Have a lovely Christmas and hope to see you in the new year for our new monthly challenges!